It had been cloudy and a bit drizzly all day, the kind of day where Pacific Northwest gray pushed through your coat and found that spot that gives you chills. Warm light was something that would need to be manufactured today. But, the end of the day would be different. Sunset had been teasing me for most of the drive south from Oak Harbor. For the first time there was sunlight, but just in the sky. Some clouds glowed and others shined. The gray stubbornly held onto the ground. On impulse, I drove to Driftwood Park, just west of the Coupeville Ferry Terminal. The park is a long beach completely exposed to the open water of Puget Sound and the current has crammed the beach with tree trunks and matchsticks of all sizes. Puget Sound was expansively gloomy. A distant bluff was aglow. There’d been a break in the gloom! But, it was too far away to warm the gray that had me chilled. I watched the white caps of the Sound remind me of the power of the sea-vacant, uncaring, and unthinkably strong. 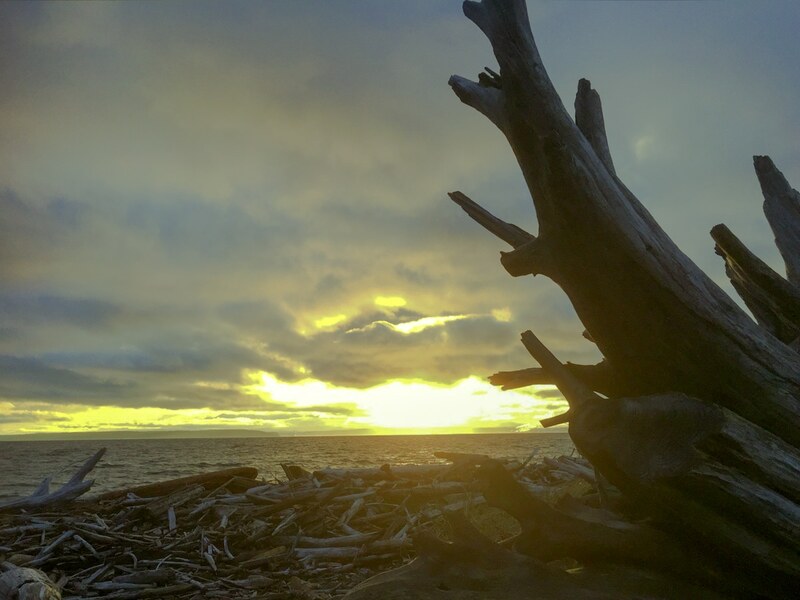 Beaches on Whidbey and Camano Islands, like all around the Puget Sound are all a little different from each other; hidden inlets, mud flats, shell-strewn, sheltered, or full-face into the elements. They’re as different as people. Meeting one does not mean you’ve met them all. My wait paid off. Like a light on a stage, nature’s sun keyed on the beach. 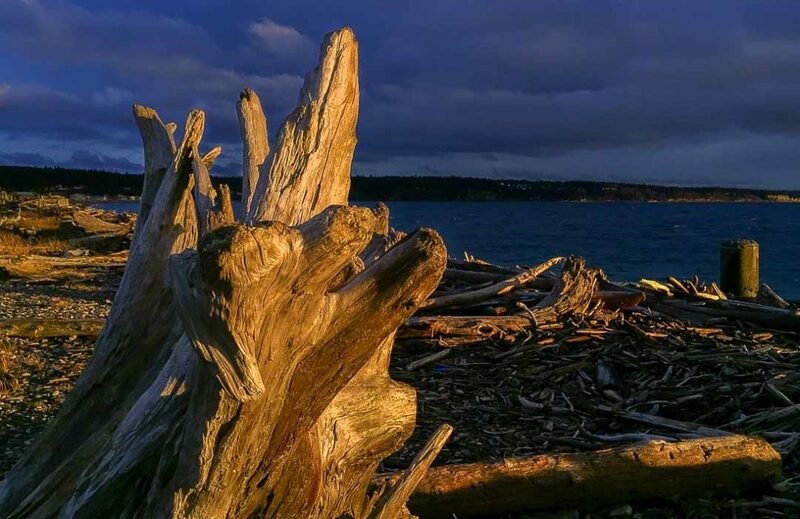 The light skipped the miles between the bluff and the driftwood in front of me, leaving them gray and unloved. In front of me, this sea-battered root, blazed. The gray chill within me slipped away, unmissed.